1970s Brooklyn sets the stage for the action-packed thriller, Blood Ties, headlined by Clive Owen (Children Of Men) and Billy Crudup (Almost Famous), coming to Blu-ray Disc (plus Digital HD UltraViolet), DVD (plus Digital UltraViolet) and Digital HD June 24 from Lionsgate Home Entertainment. Blood Ties is currently available on Video on Demand and Pay-Per-View. The film also stars Marion Cotillard (Inception), Mila Kunis (Black Swan), Zoe Saldana (Star Trek), Matthias Schoenaerts (Rust and Bone), Noah Emmerich (TV’s “The Americans”), Lili Taylor (The Conjuring), Domenick Lombardozzi (HBO’s “Boardwalk Empire”), John Ventimiglia (HBO’s “The Sopranos”), Griffin Dunne (Showtime’s “House of Lies”), Jamie Hector (TV’s “Heroes”), Yul Vazquez (Captain Phillips) and James Caan (The Godfather). 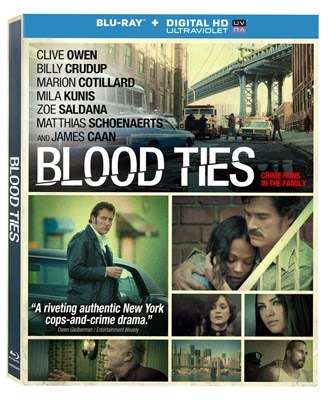 The Blood Ties Blu-ray Disc and DVD, including a behind-the-scenes featurette. Blood Ties is directed by Guillaume Canet (Little White Lies) from a screenplay by Guillaume Canet & James Gray (We Own the Night), and based on the movie Les Liens du Sang by Jacques Maillot. The screenplay by Jacques Maillot (Froid comme l’été), Pierre Chosson (Froid comme l’été) and Eric Veniard (Nos vies heureuses) is based on the novel Deux Freres, Un Flic, Un Truand written by Michel and Bruno Papet. Blood Ties begins when Chris (Owen) is released from prison. Reluctantly waiting for him on the outside is his younger brother Frank (Crudup), a cop with an aspiring future. After trying to stay on the straight path without any success, Chris inevitably descends back into a life of crime and puts Frank in a tough predicament. Does he cover for his brother and salvage the only family he has? Or does he do the right thing and risk destroying everything he loves?